Are oil filled radiator heaters dangerous or not? It’s a common question many ask along with similar safety-related questions about these kinds of heaters. In this article, I try to answer these safety questions for you, along with other safety-related questions and tips in this complete guide to Oil Filled Heater Safety. • Can oil filled heaters be used as a main heating system? • What are the dangers of oil filled heaters? • Are oil filled heaters safe to leave on over night? Oil filled heaters create heat by warming oil inside sealed columns or fins. Air then passes over and around these columns which then distributes into your room, the room, heated air. It is a great way to heat your home as it provides a quiet, gradual and efficient way of heating. 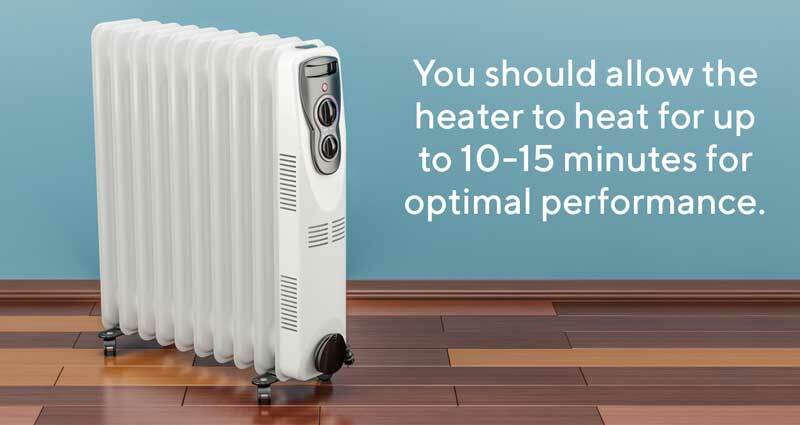 You should allow the heater to heat for up to 10-15 minutes for optimal performance. Especially if you have kids or pets around your home. While oil heaters are a fantastic way to heat your home, there are some things to be aware of when using them. One of the first places to start in regards to oil filled heater safety is the independent safety tests the particular unit has passed. How do you know if it has passed any? Look for the following certifications (depending on your country) or ask the seller which ones the heater has passed/undergone. If the unit has certification from some or all of these safety tests then you can consider your heater ahead of the pack when it comes to safety. What do these places do? Effectively they are companies and organizations that certifies, validates, tests, verifies, inspects, audits products. If these products pass then they are given certification from that agency. It helps customers feel safer know the products have been safety tested. Wouldn’t you like to know the product you are bringing into your home, which has inherent risks, has been rigorously tried and tested before you start using it? Imagine getting a product off the shelf with no testing and being the crash test dummy. So be sure to look out for these marks of certifications before you buy. Where to put an oil filled heater in your room? I think we can agree that most people want to optimize their efficiency when heating their room and hopefully save money in the process. 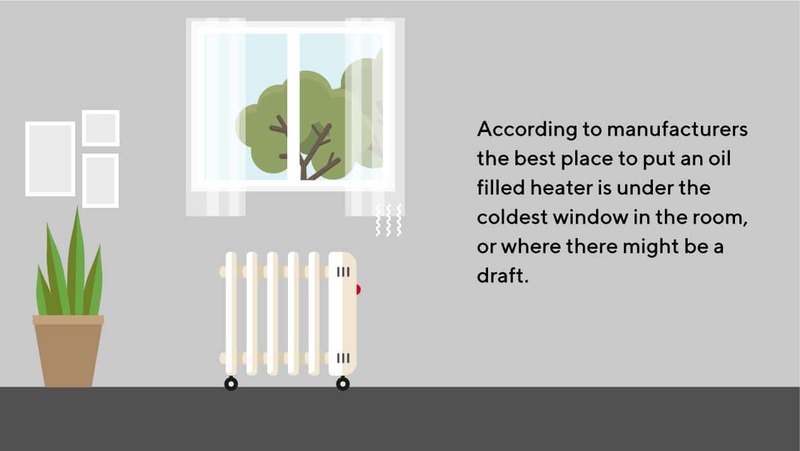 A good way to do this is to make sure your oil heater is in the best place in the room for optimum heating. So where in the room is that? Well, according to the manufacturers the best place to place your oil filled heater is beneath the coldest window in your room, or where there might be a cold draft. Having the heater there will reduce the effects of the cold draft helping warm your room, and also reduce the cooling effect of the draft. For safety reasons, your heater should not be placed immediately below a power outlet. Can oil filled heaters be used as the main heating system? Unless you have a very small house you are not likely to heat your whole house with an oil filled heater. They are generally made for small to large rooms, not entire homes. If you usually spend time in a couple of rooms, such as a living room and bedroom, you could certainly cut out the use of other heating appliances. This is what we do for our bedroom at home and it works well for us. We are also lucky that we have a very well insulated house with double glazed windows which retains the heat well. Having a well-insulated house is critical in retaining heat and keeping those energy bills low. How do you set the thermostat on oil filled heaters? Before we get to what temperature is ideal for setting your thermostat to, it’s important to understand how the thermostat works. It is a point of confusion, but the thermostat on the oil heater works to the temperature of the room and not to the temperature of the heater itself. What temperature should you set your thermostat too? The World Health Organization’s standard for comfortable warmth is 18 °C (64 °F) for normal, healthy adults who are appropriately dressed. With that said, there is always the opportunity to save a bit of money if you prefer. Oil filled heaters do come with some potential hazards, which is why having safety certification is important. They also come with a number of safety features, so be sure to look out for these if you are thinking of purchasing. Thermal cutoff or overheat protection. This feature ensures your heater does not get too hot by shutting off automatically when it reaches a certain temperature. This will help prevent any serious burns and also reduce the risk of fires should anything happen to be placed over the heater. Not so much a safety feature as it is a convenience feature, but many models come with anti-freeze to prevent the oil inside the heater from freezing. If your pipes freeze, your heater will be pretty much buggered. A super important feature for those that have pets, or clumsy humans around the house. It is no secret that one of the cons of oil filled radiator heaters is the fact the fins are exposed and it really is not that difficult for someone to get burned. Fortunately, these days you are able to find oil filled heaters that have covered fins. This means no more exposure to warm surfaces and far more safety for small humans and animals. I don’t know about you but I personally wouldn’t settle for a heater without at least the first 3 safety features. And to be honest, some of the covered oil heaters do look pretty slick! What are the dangers of oiled-filled radiator heaters? Below are a few of the most common questions about the danger of oil filled heaters. Can oil filled heaters explode and cause a fire hazard? Oil filled heaters are not likely to explode. If everything is working as it should be with the heaters and nothing is covering the vents and there is no oil leak, then you should likely be fine. They can be a fire hazard. Also, if there are easily flammable or easily melted items placed on the heaters this will also be a fire hazard. It is always recommended that you never leave an oil heater unattended for these reasons. But for the most part, if you use caution, have adequate safety features, and correctly working unit you shouldn’t have an issue. Like anything that gets hot, you just have to be smart about things. It is a fairly common question and certainly a legitimate concern when it comes to oil filled radiator heaters. Do they release carbon monoxide? There are no fumes and the heaters do not produce carbon monoxide. The oil inside the heater is never burned therefore no gasses are released. It is only heated inside a fully enclosed frame. If you have a heater that is burning fuel of some sort, then you will need to be concerned and ensure there is adequate ventilation. I’d just like to adequately point out something that something the manufacturers highly stress: Never leave an operating unit unattended. Now does that mean you can’t leave it on overnight? Manufacturers such as Lasko recommend to never leave your heater (of any kind) on overnight. But, and I’ll have to say, I’m guilty of this too, many do leave their heaters on overnight. There are pros and cons in doing this. Leaving your oil filled heater on overnight can cause dry skin and dry throats which are highly uncomfortable. The good thing about heaters, oil filled or otherwise these days, is they have many features available which make using a heater at night. Features such as timers – for turning a heater off late at night, and on early in the morning. This is actually what we do, so we are warm when we go to sleep and it is not cold when we get up. Usually, we would retain enough heat as to not get cold in the space in-between. Colder climates, however, have the additional option of using the in-built thermostat. This way the heater can turn on and off as per the temperature of the room, in which case it would not be on all night. There are a number of heaters that allow you to program in certain temperatures for certain times in the night (and day) to enable more safety as well as an energy saving routine. There are even oil filled smart heaters of which you can control on your smartphone. Other safety tips for oil filled radiator heaters. Always remember that oil filled heaters are not intended for use in bathrooms, laundry or any areas where there could be any form of contact with water. Water and oil filled heaters do not mix! Manufacturers always recommend to not run the cords of an oil heater under any carpet, rugs, runners, or anything that will cover the cord. In order to prevent fires always make sure any air intakes are not covered or on soft surfaces or places where opening may become blocked. They should always be plugged in directly to the power socket. A few other things to note in regards to oil filled heaters. • As the heater warms up, the oil in the metal columns may naturally expand and make a slight ticking sound. This is normal and will stop once the oil has reached the optimal temperature. I hope this article helped answer some of your safety concerns in regards to oil filled heaters. Not sure which kind of heater is right for you? Check out our guides on ‘oil heaters vs ceramic heaters‘ and ‘oil heaters vs electric heaters‘. Got a question, or something to add? We would love to hear from you. Feel free to comment below!